A deeper dive into the HomePod firmware that was briefly available over the weekend shows the A8-powered device will boast 1GB of RAM available and a 272-by-340 pixel screen, suggesting that rudimentary app support will be possible for the hardware in the future. 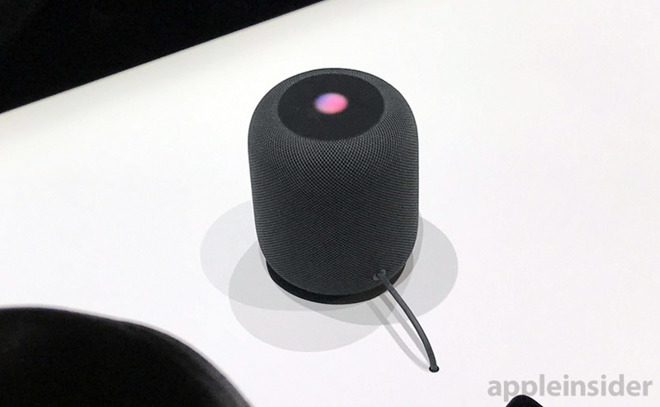 Details from the HomePod firmware were gleaned by Avery Magnotti, and revealed to the world in a tweet. The resolution is the same as the 38mm Apple Watch screen. A teardown of the S1 chip on the original Apple Watch showed 512MB of RAM. For comparison, the iPhone 7 Plus has 3GB of RAM, and over 22 times the number of pixels. If the report is accurate, the HomePod will use the same processor specifications as seen in Apple's iPhone 6. The reported 1GB of RAM appears to be overkill for the functions of the HomePod, even including a future expansion of Siri. It is unclear what Apple intends to do with it in the future, but a prediction of future app support for the device seems obvious. A graphic that appears to represent the form factor of the as-yet unreleased "iPhone 8" was also gleaned from examination of the firmware, as well as resolution and display size information.